As the results of different boards are coming out, the students are rushing for admission into various universities for higher studies. 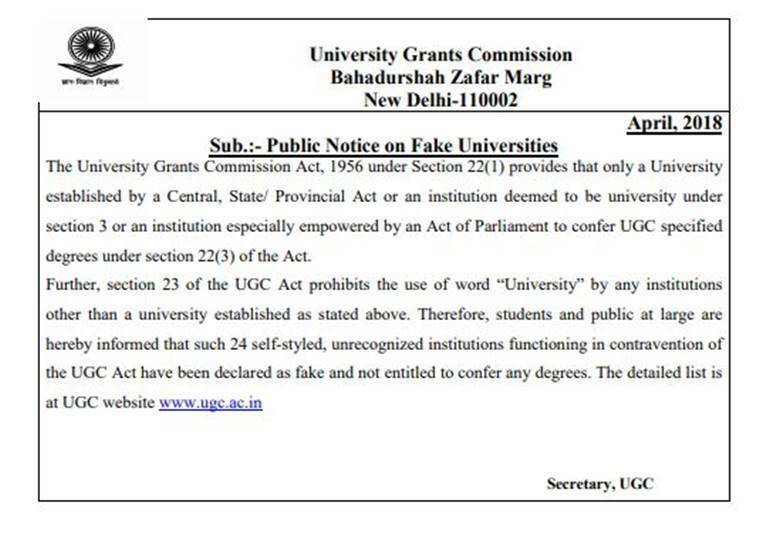 In the interest of students, the University Grants Commission (UGC) on Wednesday released a list of 24 fake universities which are functioning in this country. “Students and public at large are informed that at present following 24 self-styled and unrecognised institutions are functioning in contravention of the UGC Act in various parts of the country,” a notice issued by the UGC read. “These universities have been declared as fake and are not entitled to confer any degrees,” it added. Out of these twenty-four fake universities, eight are from Delhi. These universities include Commercial University, United Nations University, Vocational University, ADR-Centric Juridical University, Indian Institution of Science and Engineering, Viswakarma Open University for Self-employment, Adhyatmik Vishwavidyalaya and Varanaseya Sanskrit Vishwavidyalaya. Last year too, UGC had released a list of such fake universities which included Maithili University/Vishwavidyalaya, Darbhanga (Bihar), Varanaseya Sanskrit Vishwavidyalaya, Varanasi (UP), Commercial University Ltd Daryaganj (New Delhi), United Nations University, Delhi and Vocational University, Delhi.